Last week the Coalition for Paid Sick Days presented before the Board of Supervisors the case for San Francisco’s ailing workers. Today, the coalition, which consists of Young Workers United, the Chinese Progressive Association, SEIU-Committee of Interns and Residents, Center for Young Women’s Development, and Young Community Developers, continues to perfect the legislation that will go onto the November 2006 ballot. 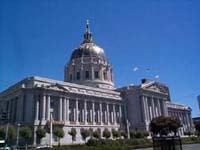 The proposal is expected to go through with the support of supervisors Peskin, Maxwell, Daly, Ammiano and Mirkarimi. According to Dante Grant, member of Young Workers United and one of the legislation’s authors, the decision to make paid sick days a ballot measure was for the sake of “education”. The legislation strives to alleviate the plight of over 100,000 private sector workers who lack the right to paid sick days. It mandates individuals who work at least thirty hours per week in exchange receive one hour of paid sick leave. Furthermore, it permits workers to essentially accumulate sick leave credits, allowing them to use their accrued hours at their discretion. In response to small business concerns, crafted into the measure is a distinction between the amount of compensation different sized businesses must provide. Workers in businesses with ten or fewer employees are only allowed to accrue up to forty hours or five eight-hour workdays of paid sick leave while workers in businesses of ten employees or more are allowed to earn up to 72 hours or nine eight-hour workdays of paid sick leave. The Young Workers estimate it would take an individual about seven months to accumulate the threshold number of sick days in the smaller business and approximately a year and two months in the larger. But despite the coalition’s efforts, business leaders still adamantly oppose a paid sick day law funded by entrepreneurial dollars. It is yet another piece of progressive legislation whose costs will be borne on the profit-driven community. As a result, the coalition’s concessions have fallen on deaf ears. In order to avoid double coverage, Grant did assure the coalition the measure would comply with a business policy known as “intent equivalency”. Intent equivalency mandates workers who already have nine paid sick days, most likely through union-based activity, are not entitled to coverage from their employer. As long as a business is up to par with the legislation’s standards they do not have to change their policy. Along with the minimum wage ordinance and health access program, the Office of Labor Standards Enforcement (OLSE) would monitor the provision of paid sick day compensation. Nonetheless, the authors plan to give the resolution some additional teeth. Currently, the coalition is engineering a series of penalties, intended to encourage businesses’ compliance with the legislation if passed. As Alex Tom of the Chinese Progressive Association explained it, if an employer denies his workers sick day compensation, he is liable to pay up to five times the amount he originally refused in penalty fees. For example, a laborer earning the minimum wage of $8.82, if denied compensation for a full eight-hour workday would be entitled to $8.82 x 8 x 5 or $352.80. Conversely, penalties will be levied on employers who force an employee to work when he has requested sick leave. The OLSE would handle such infractions on a case-by-case basis. According to Tom, “workers have a fear of retaliation [from employers]”. Low-income laborers especially know if they choose to take a day off their employer in turn could choose to replace them. For that very reason, the legislation would prove especially significant for non-union workers. The Chinese Progressive Association in particular represents a majority of workers lacking sick day coverage and most of them are non-union, low-income garment and restaurant employees. Legislation is essential to extend job protection to all workers of San Francisco. But even union workers are signing on to the sick day movement. Tom explained union workers often have coverage that is not comprehensive and each time they want paid time off they may have to negotiate with employers. The coalition’s work promises to raise the floor of standards for all low-income laborers. The medical community also stands to gain from the current proposal. SEIU, the union, which represents intern and resident physicians at San Francisco General Hospital, has practiced loyal dedication to the coalition since its roots. San Francisco General doctors see many of the underserved, low-income residents of the city and bear the consequence of restrictive employers through ambulatory visits and emergency treatment. Because common sense dictates preventative care is the most effective type of care, many of the city’s doctors have stood firmly behind the legislation, which places a greater value on health than money. If passed the measure will be implemented in February 2007, at which point all currently employed workers will start accruing hours toward sick day coverage. Anybody employed after the start date will undergo a three-month “parole” period before they begin accruing. This is intended to ease the transition for businesses. Regardless, this will be a divisive issue, decided by those who can take time out to bring themselves to the polls.